Kevin Kelly at left with for U.S. 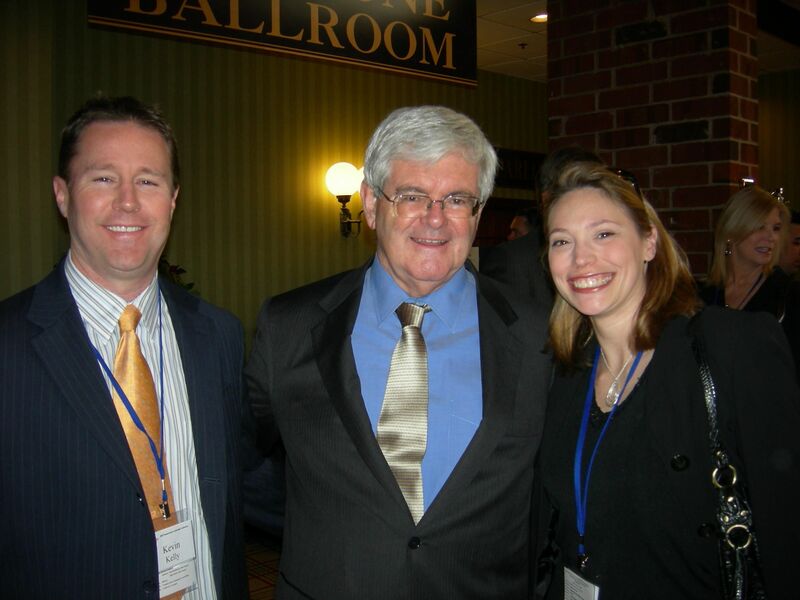 Congressman Newt Gingrich at a Philadelphia Republican meetup meeting on April 1, 2007. This evening I sat in on a meeting of the loyal opposition, a group of some in the city’s Republican community who are looking to create a viable GOP in Philadelphia. The group is led by Kevin Kelly, a former president of the Philadelphia Young Republicans, and a businessman determined to see an active two-party system in the city. He’s developed a meet-up group online and is all for converting Democrats to create competition. Kelly grew a reputation last year by circulating a manifesto of sorts for reviving and reforming the city’s Republican Party [PDF]. After the meeting, a perhaps surprisingly diverse group of 15, including guys like the long-time 5th ward Republican leader Mike Cibik. They were fielding questions from Philadelphia magazine writer Steve Volk and discussing their own positions on the party. Afterwards, I got to speak to Kevin Kelly alone, and he was largely critical of the complacency into which the city’s GOP had fallen, he said. His movement and critique will find a large part in my paper. Photo courtesy of Philadelphia Republican Meet up Group. This entry was posted in Interviews and tagged Kevin Kelly, Philadelphia Republican City Committee. Bookmark the permalink.